One of the unique aspects of Philippine cuisine is how we can essentially have the same dish, but with variation for each region. One example of this can be seen in the case of the longganisa. The longganisa, also known as the Philippine sausage, traces its roots to the Spanish era. Each region has its own way to prepare and cook longganisa, and each has its own merits. Do you want to expand the horizon of your family’s palate? Here’s an innovative longganisa recipe from Del Monte Kitchenomics that combines delicious flavors from Southern Tagalog: Lucban longganisa and kesong puti, in one tasty dish. Longganisa, our very own version of the Italian meatball, is the perfect meat for pasta. The strong flavor of the Lucban longganisa is a perfect complement to spaghetti sauce and kesong puti. Lucban longganisa has strong garlic flavors, and it can be served with or without the casing (also called “skinless”). Kesong puti is a local cheese that has a distinct taste. It is soft, white, and made from carabao milk. Its taste and consistency are comparable to cottage cheese. All these flavors and textures combine in this delicious spaghetti recipe: Longganisa at Kesong Puti Pasta. Start by cooking the noodles. Then, sauté chopped onions and longganisa in a pan. Add Del Monte Italian Style Spaghetti Sauce, and then add salt and pepper to taste. Cover the pan and let it simmer for a few minutes. Mix half of the sauce with the pasta, and transfer to your serving dish. Then pour the other half of the sauce over the pasta. Top the dish with kesong puti and fried garlic. Make sure that you top with just a drizzle of kesong puti because the strong flavor might overwpower the dish. Alternately, you can serve the pasta with a side of kesong puti. When you sauté the onions with the longganisa, make sure that the onions are caramelized and that the longganisa is cooked until brown. This will release the oils from the longganisa, which mix well with the onions, and add more flavor to the sauce. 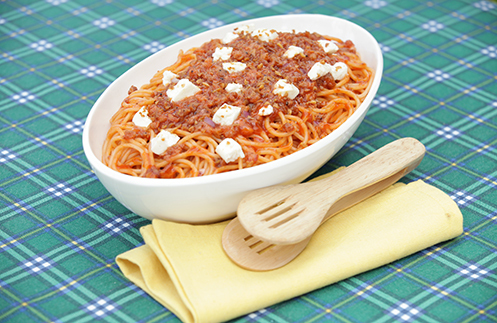 Make sure to use Del Monte Italian Style Spaghetti Sauce, which mixes well with the longganisa oil and the flavors of the kesong puti. By tossing the pasta with half the sauce, you can make sure that it mixes well with all the pasta noodles.